Winner of the inaugural Morrisons Beef Shorthorn Suckler Herd of the Year Award 2011 is Glenapp Estates, Girvan, Ayrshire managed by Charlie Russell, who was praised for his attention to detail in maximising the potential of the Beef Shorthorn within his 300 cow herd. 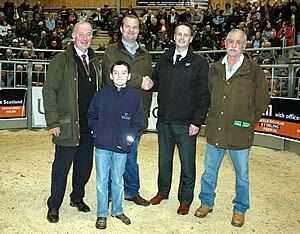 Judge, Gavin Hill congratulates the winner, Charlie Russell with his nephew, James Scott along with left, Beef Shorthorn Society president, Charles Horrell and right, finalist Michael Cleasby, Overdale Farms’ farm manager. The runners up are Ormsary Farms, Lochgilphead, Argyll and Overdale Farms, Scarborough, Yorkshire. Each of the three finalists received a £250 voucher towards the purchase of a Beef Shorthorn bull at a society sale, while the winner was presented with a £500 cash prize. The finalists were judged according to herd performance, technical and financial management, genetics, herd health and marketing. Judge, SAC beef specialist Gavin Hill, commented: “It was an extremely close-run competition between the three finalists with all of the herds of the highest caliber and demonstrating excellent management of the Beef Shorthorn with high fertility rates and number of calves reared together with a tight calving period. Each herd was also achieving high returns from their Beef Shorthorn sired progeny with females developing as suckler cow replacements to be either kept in house or sold on, and steers realising weight gains comparable to many of the continental breeds. In addition, all of the farms that I visited benefited from top level stockmen and the focus on herd health was also particularly encouraging. “UK suckler herds have high fixed costs which have a major effect on profitability, however Charlie Russell addressed these factors very early on and that’s what gave Gleapp the edge over the other finalists. He has adopted a system that maximizes output while reducing costs; initially he appraised the land type and its capabilities followed by making the correct choice of cattle breed for Glenapp. 12,400 acres upland; nine full time staff. Glenapp Estates run a 300 cow suckler herd as one of a mix livestock and arable enterprises. Half the herd is put to the Beef Shorthorn bull which is also used as a sweeper among the 700 cow dairy herd. Beef Shorthorn was chosen at Glenapp because of its longevity, fertility, ability to ‘flesh up’ and live off it over winter, docility, calving ease, hybrid vigour, calf growth rates through maternal trait of milkiness in daughters, foraging ability and gut capacity and the premium that’s paid for Shorthorn beef. Profit is driven by minimal wintering, machinery and labour cost combined with good health management and never compromising calf growth rates without understanding the true costs of doing so. Spring calving cows calve over an average seven week period, calves are crept during the last month before weaning in October having achieved an average 1.15kg target daily liveweight gain. Bulls are finished to 360kg deadweight at 14 months while heifers are retained as replacements, sold for breeding or finished at 24 months and 320kg deadweight. 17,000 acres over two units – one uphill, one lowland; six full time staff. Ormsary Farms run 215 beef cows with 100 cows put in calf to the Beef Shorthorn, split calving in spring and autumn and with calves receiving creep fed to a target of 1.2kg daily liveweight gain. Calves are either retained as replacement heifers, sold as weaned, stores, breeding or finished at around 21 months at 290kg deadweight. The herd has adopted a health plan working in conjunction with its vet. The Beef Shorthorn is preferred by Ormsary for its capacity to produce heifer replacements that are able to rear quality and marketable progeny. The business also credits the Beef Shorthorn’s docility and ability to maintain a closed, healthy herd. 535 acres – lowland and upland; 1.5 full time staff. Overdale Farms runs 125 suckler cows with two thirds of the split calving herd put to the Beef Shorthorn to achieve a 96% calving record. Calves are fed creep to realise an average 1.25kg daily liveweight gain. All progeny apart from heifers destined for replacement purposes are finished on the farm at 16 to 18 months and 340kg to 390kg deadweight and sold direct to Woodheads for the Morrisons native breeds’ scheme. Top priority is given to herd health and animal welfare, high quality, clean, housing, good grazing and tight calving patterns The herd benefits from a high health status and has adopted a herd health plan. Introducing the Beef Shorthorn to Overdale Farms has enabled the unit to produce premium eating quality beef associated with English bred cattle with the potential for the economic performance of continental breeds, the well conformed carcases hang well and the beef is readily marketed.